[Pedrick]’s bold vision for a gasoline-free future. At first sight, GB1405575A, “Propelling automobiles without using petrol or gasolene” ([Pedrick]’s spelling, not a typo) might seem to conceal a genuine innovation in the field of automotive endeavour. but the drawings accompanying the patent application reveal a debt to an earlier era. A horse is harnessed behind a car, and its forward motion is precipitated by moving its manger away from it in the hope that it will start walking forwards to reach its food. The brake pedal is connected to the animal’s head collar, and the ignition switch administers a mild electric shock to the unfortunate animal to set it in motion. A refinement has the horse in a hamster-wheel style treadmill, allowing it to rest during periods in which the car freewheels. We can see that this vehicle would work, and given the right horse, might even reach the required 5 miles per hour for use in the busy streets of a modern city like London. However we can also see some problems with the extra length of the horse and manger, parking that much vehicle could be a challenge. Let the correct cat in, and possibly save the world. In GB1426698A, “Photon push-pull radiation detector for use in chromatically selective cat flap control and 1000 megaton earth-orbital peace-keeping bomb“, [Pedrick] demonstrates his talent for solving problems on both a mundane and global scale simultaneously. While ensuring that the domain of his elderly but hyper-intelligent talking ginger cat is not encroached upon by a black cat belonging to his neighbours, he also applies his mind to the problem of maintaining the peace in a world that was then at the height of the Cold War. His detector could distinguish between the coats of passing moggies when driving a cat flap, or notice the flashes of missile launches when attached to an orbiting satellite. The satellite would then launch 1000 megaton nuclear bombs on the perpetrator, thus ensuring the peace through mutually assured destruction to entirely new levels. We are naturally impressed with this versatile technology, but given that the hyper-intelligent talking cat here has a rather beautiful tabby coat, we can’t help wondering whether its usefulness might not extend beyond ginger and black animals. Is There Anything More Important Than a Cup of Tea? Some of [Pedrick]’s inventions were not especially high-tech, yet they still applied to particularly important subject matter. GB1351926A for example, “Improvements In Tea Strainers” tackles the problem of finding the most efficient design of sieve to stop tea leaves ending up in the inventor’s favourite hot beverage. A variety of configurations are modeled, before finally a design of interlocking wires forming a hexagonal tessellation is found to be the best. Sadly for [Pedrick], the introduction of the tea bag has rendered his invention largely obsolete. We are however completely convinced that the completely novel and unique design would have made it stand out from the crowd of superficially similar but inferior strainers, and in fact had he commercialised it at the time then the history of hot beverages might have been completely different. [Pedrick]’s ultra-large air liner, side view. [Pedrick] was at work during the golden era of the Jet Age, during which the marvels of international flight were becoming available to the masses for the first time, and ocean liners were constantly going out of business. Bravely foreseeing a market for ultra-high-capacity aircraft that would not be fulfilled for several decades, he proposed in GB1439086 (A), “LARGE FLAT BASED LOW FLYING AIRCRAFT USING FASCES OR BUNDLES OF BODIES OF EXISTING LARGE AIRCRAFT SUCH AS THE BOEING 747”, that multiple fuselages could be attached side by side to form a huge aircraft that might fly over the oceans at very low altitude and carry huge numbers of passengers in safety and comfort. Sadly the aircraft was never built, so we will never know whether it might have delivered on its promise. It would be several decades before the vision could be at least partially realised by the advent of so-called superjumbo aircraft. You might expect that this could be an April Fool’s joke in which we take a series of either preposterous or extremely obvious ideas and present them as groundbreaking and visionary, accompanied by unlikely home-drawn diagrams in glorious ballpoint. But in fact there is no joke other than the one [Pedrick] was pulling on the organisation he had served. He was a real retired civil servant, and all his applications were genuine. Who knows, some of them might even have worked! Thanks [Clare] for the suggestion. ← [Ashhar Farhan]’s done it again! also…should Ikea be paying royalties? 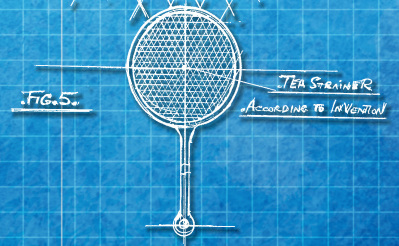 The link in the article says the patent is for three parallel sets of wires making hexagons and triangles, the Ikea tea strainer has only two sets of parallel wires making squares. In my layman opinion on the answer to your question is no. Well spotted! The devil’s in the details, I guess. I had been under the impression that his cat was white. This is a very good example of an incomplete thinking process, the man had a mind full of facts and could be creative (divergent thinking), he could even document the results reasonably well, but he lacked the scientific and engineering knowledge to fully converge his thinking down into complete and workable solutions that were relevant. I know about this topic as I read in the area of teaching gifted students in the context of creativity, it is a really important point as some newer teaching styles go a bit far in the other direction from classical training and also produce students with incomplete skills. i.e. There has been a reaction against rationalism and rote learning, but the result is no better than the minds who in the past were so constrained that they could not find creative solutions to novel problems. If traditional teaching is > and the new way is < then what is really required is . Open your mind, collect the set of all possibilities, then distil it down to something rational again. Or consider the possibility he did it for the LOLs. Possibly, but the truth is more likely to be a lot more tragic, it is likely that his behaviour was the result of a form of frontal lobe dementia that causes disinhibition. Often this results in deviant/inappropriate behaviour but some times it unleashes a huge flow of creativity from people who never showed such a tendency earlier in life. People named ‘Dan’ make the most inane comments ive ever seen. You should get out of your mum’s basement more…. Bla hblah blah. What inanity you people named simply ‘Dan’ spout! Whichever you are. Nuke was over kill… Just need to drop a Rods from God. But the Arthur Paul Pedrick was ahead of his time. “Nuke them from orbit it’s the only way to be sure.” Hey, Hey, Hey! Aliens 3, there was one in the Cat! I just have to question the ethics of being a patent examiner while simultaneously owning patents. He was a retired, i.e. former patent examiner when he filed them. This is like a retired fireman becoming an arsonist. Perhaps more like becoming a pyrotech? Still an arsonist at heart but responsible. I reckon he did it for the LOL’s and irony. I think he became a patent troll, in the sense of trolling the patent system. There was a fellow by the name of Geoffrey Pyke, who during WW2 came up with all sorts of far-fetched (I won’t call them crazy) ideas and inventions to further the Allies war effort. A bit of a mad genius, well at least he thought them so, the top brass thought otherwise but he kept pestering high-up people and even caught the attention of Churchill. Some of his invetnions such as the frozen unsinkable iceberg aircraft carrier were too big to be built practically, though a small model showed promise in the resilience of his invention ‘Pykrete’ which was water mixed withg sawdust and then frozen.Another of his inventions was a commando snowmobile which led to the development of the M29 Weasel cargo and personnel carrier. Worth googling up and there was even a book written about him. Sshh… Don’t you unbust the MythBusters. Bone powder from any farm produce Or Bamboo charcoal would work just as well a ‘Pykrete’ add Distilled water, pinch of salt, sugar and hand-load as usual (in a walk in freeze). P.S. You forgot to mention the “Pykrete” aircraft platform lasted through the warm spring.